Works very well BUT needs mechanism to CLONE Instructions could be clearer (and up to date would also be nice). There should be a way to setup a second phone without having to remove and re-add the 2 step authentication. I’d have thought you should be able to long click on an account and choose show barcode (probably after confirming password) and then that could be scanned on new phone. 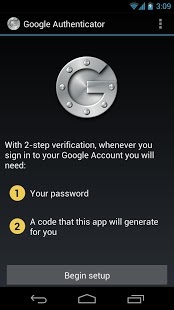 It also asks you to install a NON-EXISTENT barcode app, just install GOOGLE GOGGLES, that will do the trick. Like all Google products lack of support can be an issue. Making 1 star until click on code copies to clipboard or its integrated with the dialogs requesting the codes.